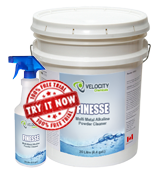 FINESSE is a low foaming powdered high temperature automatic parts washer cleaner for all metals. It is used by engine rebuild shops, mines, railroads, transmission shops, etc. to remove carbon, oil, paint and other contaminants from various parts and equipment in automatic parts washers. Remove excess grease prior to application. Dilute FINESSE to 1 – 2% concentration and use at temperatures ranging from 71°C to 82°C (160°F – 180°F) in automatic parts washers.